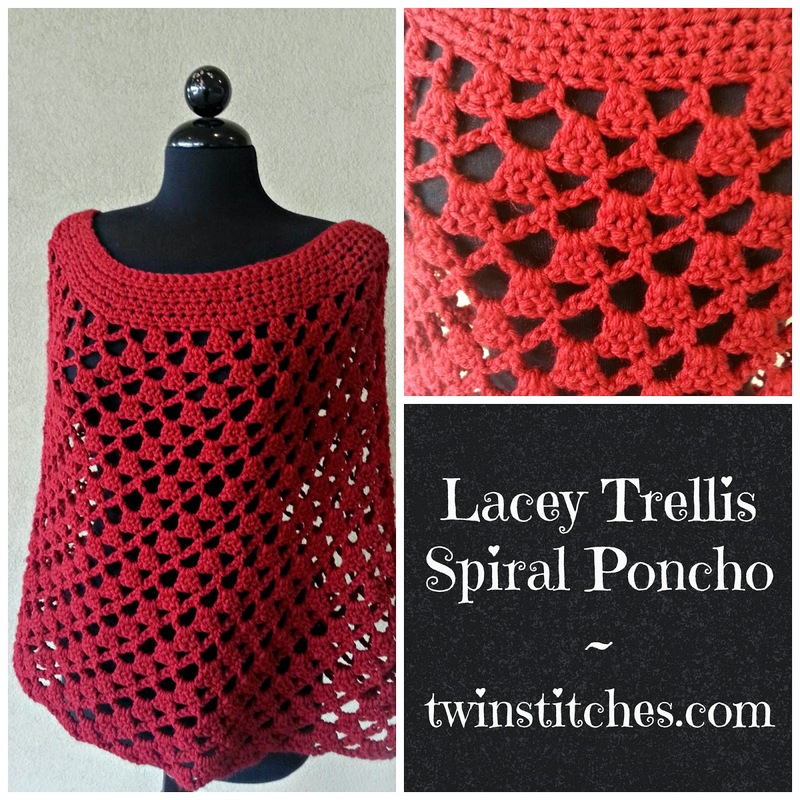 Have you tried the original Lacey Trellis Poncho? I've made five since I posted the pattern. They are so ridiculously quick to make! I even entered one in the community art show at school. I've been wanting to try to make the Lacey Trellis in the round for quite some time, but never had time to sit down and try it. Last week, I decided to see what I could come up with. In my mind, it looked just like the Lacey Trellis above, only the trellis was vertical instead of horizontal. Silly me forgot that the trellis only happens because you work the pattern back and forth.. As I started the pattern, I worked in the round without a join. The result was this amazing continuous spiral. What is awesome is the amazing spiral pattern that started because I was working in the round! * For the rows 2-8, the chain 2 does NOT count as an HDC. At the end of each of the first 8 rows, join to the top of the first stitch and continue in the round. Before you begin your poncho, you need to decide whether you would like it to hang off your shoulders or would like it to stay on top of both shoulders. I made this poncho for a friend, but when I made one for me, I measured the distance between my bra straps and doubled it to find my starting chain length. Starting chain should be a multiple of 8 + 1. Chain 81, slip stitch to join. Be careful not to twist. *Note this row MUST be a multiple of 6 stitches + 4. (For example, 64, 88, 112, 136, or 160) If you see that you need to continue to increase, make sure that your final row is a multiple of 6 stitches plus 4. The trellis is crocheted in the round, so when you come back to the first chain 3, you will continue the pattern into row 2 of the trellis. Trellis Row 1: *Chain 3, skip 2 stitches, SC in the next stitch, chain 3, skip 2 stitches, 3 DC in the next stitch. * Repeat from * to * around. The last set of stitches in the first row of the trellis will be a chain 3. You will still have two stitches between the last sc and the beginning chain 3. Continue the pattern by crocheting 3 DC in the beginning chain 3. From that point forward, continue with this pattern: *Chain 3, SC in the top of first DC in the next 3 DC cluster. Chain 3, 3 DC in the next chain 3 space. * Repeat from * to *. Continue the spiral trellis pattern until your piece has 20-24 rows of trellis. If you would like, you can continue longer than this, but 20-24 rows will result in a piece that ends just below your elbows. End with a SC in the top of the first DC of a 3 DC cluster and a slip stitch in the second DC. Fasten off and weave in ends. 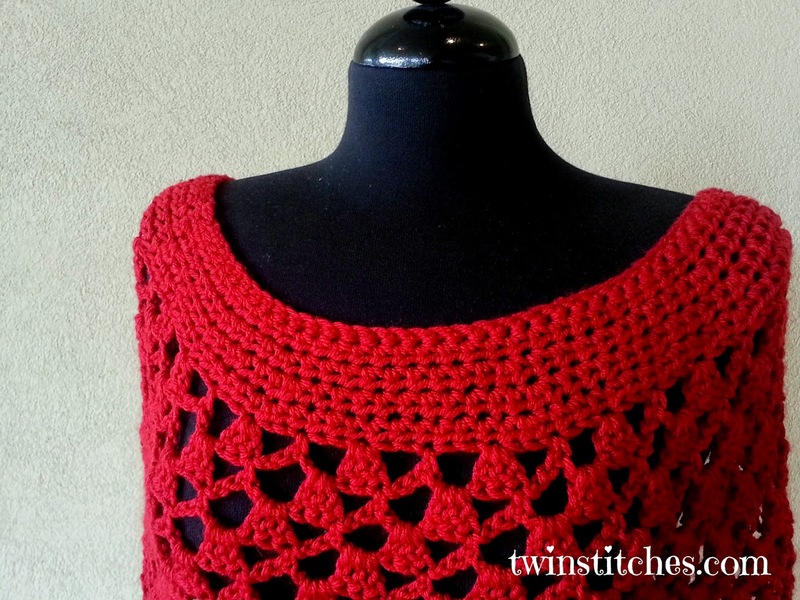 This pattern should fit most adult women sizes L-XL using Red Heart with Love yarn and a K hook. If you would like to use a different yarn or hook size, you will need to determine the correct number of chains to begin. To determine your number of starting chains, you will need to measure the distance from one shoulder to the other and double that distance. Your starting chain should be that length and follow the multiple of 8 + 1 rule for the beginning chain. If you need to make the pattern smaller or larger, your initial chain should be a multiple of 8 + 1 stitches. Rows 1-6 should be multiples of 8 with an increase of 8 stitches each row. Here's how to calculate where to make your increases. Take your multiple of 8, for example 96, and divide by 8 = 12. Your repeat pattern will take place over 12 stitches. You will crochet 2 HDC into the first stitch and 1 HDC into the next 11. This will be your repeat. If your multiple of 8 is 120, 120 divided by 8 is 15, so your repeat pattern will take place over 15 stitches. 2 DC in the first, and 1 DC in each of the next 14. Rows 7-8 should be a multiple of 6 stitches + 4 stitches. NO increases. Thank you for your interest! Sorry, no video for this pattern. Once you try the stitch pattern, it is an easy repeat. Give it a try and I'm sure you'll feel the same! Trying the pattern in a larger size...I have my multiple of 8 but pictures for certain steps of the trellis would be awesome. Hi, Heather, What steps can I help with? Wow thank you for such a beautifully written pattern!! NICE!! Do you think it will do good in Carons simply soft? I like it, I'm a little older and looking for a poncho Not reflective of the 70's again, lol! I want it to be soft and drape nicely. Technically with the softer yarn it could be a tad longer and look nice too, right? Susan, Simply Soft would work fine. I have an another poncho in this stitch pattern that I made in Simply Soft. Just be certain to take your measurements and it should be fine! So beautiful. I am making one right now in Ice Yarns Magic Light. Thank you for the beautiful pattern and for letting us know how to make it bigger or smaller! That helps us so much! How do you weave in your ends in a pattern like this? Since you used two balls, how do you make it so you can't see the ends? I have been crocheting for a while but weaving in my ends is the one thing I hate most. I always feel like they are going to come out. Hi Cassie, I always try to follow the stitches I made with my ends when there are no real lines of stitches to hide my ends with.. I hope that makes sense. I completed a longer version of this for a customer, per her request (she wanted it to cover her rear end), showed her the progress and the pictures from here to see that there weren't any arm holes. She said it was perfect and she loved it. Upon completion, I went to deliver it and she said she didn't want it now because it didn't have arm holes and would make her feel like she was wearing a straight jacket. I used Lion Brand County yarn in White Mountains, and used 10 skeins to complete. Now I have to start over and adapt the pattern to meet my customer's request in length, but with arm holes as this yarn is not the type that can be frogged easily without destroying the yarn. Any suggestions? Are you asking for help in designing the arm holes or in dealing with the customer? As for the customer, I wish I had some sort of wise words to help. I designed this to be a shorter poncho. If you can't frog it, I would recommend selling that one to someone who will appreciate it and make another one for your customer. However, this time, I'd make sure I got paid before I started the project. How frustrating that she said she liked it and changed her mind like that! You may want to reconsider taking orders from her in the future. What a bummer situation! Do you think this can be sized small enough for an eight-year-old? Could you please tell me how to make this with arm holes? Hi, Kacy, I haven't written a pattern for this poncho with arm holes. If you figure out how to make one with this customization, I hope you will share it with us! Good morning Jennifer well it is morning here in the UK. I would like to make this poncho so need to translate your 2 skiens red heart love into grams and thickness to get something similar here . Red Heart with Love is approximately 170 grams per skein, so 340 total. The whole project uses 457 - 576 m of RH with Love. It's an Aran weight yarn, if that helps! In the first trellis row the pattern calls for you to Chain 3, skip 2 stitches, SC in the next stitch, chain 3, skip 2 stitches, 3 DC in the next stitch. The second trellis row doesn't mention the SC stitches in the previous round. When I start the second row I see where to place the first set of 3 DC, then chain three and see where to place the SC in the middle of the 3 DC stitches from the row below, but then I am faced with a chain 3, SC, chain 3, 3 DC on the row below. If I place the three DC in the first chain 3 space, do I then skip the SC, chain 3 and place the next SC in the top of that 3 DC cluster below? This doesn't seem to work. Based on the work that's been posted on Ravelry, I am the only having this issue as I see oodles of beautiful finished products. I really want to be able make this pattern. Any help would be appreciated! Hi, Judy! You are skipping the SC in the previous row. If you take a look at the picture, the SCs from the previous row are underneath a chain 3. You will never crochet into them. The 3DCs always go in a chain 3 space and the SCs always go in the first DC of a cluster. Does this help? It certainly did help and I am wearing my new poncho today! Thank you for the pattern--it is lovely. Oh, my goodness! I would love to see it! Hi, Jeanett, I don't have any plans to add arm holes to this pattern, but if you find a way that works for you, let me know! I really like this pattern but when i get to the trellis part the stitches doesn't really match up. i was wondering if there was a difference in the beginning. The pattern is for an 80- stitch starting out and i started out with an 88 +1 stitch. would there be a difference in the trellis stitch part? It will work no matter what multiple of 8 you start with. Here's my question: What is your stitch count after your last row of HDC? If it is not a multiple of 8, then that is your issue. Double check it! I figured out how to make hand holes work. I completed an odd number of rows of the trellis around to my original join point. I counted to make sure I had the same number of the 3DC all the way around. I decided to make that join point my side and I chained 3 for each part of the trellis I wanted to skip, so, starting from a SC in the trellis pattern I chained 3 for the chain 3, I chained 3 for the 3 DC, I chained 3 more for thr chain 3, etc until I had a wide enough opening for a hand and so that I could join that chain I was making back in at a SC in the trellis pattern. I used a stitch marker to mark where I wanted the other to start and did the same number total of chains as I did on the first side, and continued around with the trellis. When I got to that chain for the hole, I made sure I completed the trellis as if it didn't have a hole. I had just done a 3DC, then chain three, I skipped 2 stitches on the hand hole chain and then I SC into the third, I chained 3 then I did 3 DC around the chain, squished them over so they sat in line, did the chain 3 and the SC again so it sat in line with the row above...etc. I made mine in scale for an 18" doll so I can't tell you what you will need to do exactly and well everyone is going to get the hand hole at a different point in their pattern, and a different width as they need for the size of the persons wrists. It's just a bit of math to it, and the ability to visualize the pattern as you go. I hope that makes sense. https://www.instagram.com/p/BBZL7EoC9sW/ here is a photo of my doll sized hand hole so you can see what I mean. I love this. I have started the poncho three times now and my counts are not coming out like the pattern. What am I doing wrong? Ah, I just now saw that there is an update. May help my problem. is this the updated pattern? No, sorry! Only the written pattern. You can certainly use whatever weight yarn you would like to. The key is to be certain you have measured appropriately and have chained the correct number/multiple to fit that span. Please read the instructions about the math carefully so that it will work. I love this pattern and having a great time making it. Something I have been looking for in a long time and your directions are great. Thank You So Much!!! Miss Jennifer, I love your poncho. Thank you for sharing it with us. My question is, when I do my SC in the top of the 3DC cluster, do I do it in the middle of the cluster on at the first on? When I do it in the middle, it makes my previous 3DC clusters slant a bit. Thanks for your help. Thanks for your comment. The SC goes in the top of the first DC in the cluster. I hope this helps! Has anyone tried converting this to a skirt? Obviously it would need to be layered, but I'm looking for ideas for a skirt, and this seems like it would be cute. My daughter loved this pattern. Thanks a lot for sharing this pattern. Hello Jennifer, I am working on this poncho now and look forward to wearing my finished project. My question is - Do I still work the HDC rows (7 & 8) that have no increases if I work 2 extra rows to get the multiple of 6 stitches + 4? After 6 rows, I am at 120 stitches and will have to work 2 more rows of increases. Then, do I still work 2 rows of no increases. I hope my question makes sense! Thank you! Hi, Elizabeth, I think that is up to you. If after you work your two extra rows the solid portion falls just below your shoulders, that should be enough. If the multiples are correct, start the lacy portion. If you think that the solid part needs to be longer, you can add the no increase rows. I'm sorry for the delay in getting back to you!! I, too, have decided to work an extra 2 rows of increase. Then I go right into the trellis pattern. What I did discover (FYI) is that the trellis will go in the opposite direction because when you move from row 1 to row 2, you have to start with the 3DC in the previous row's chain. It is a beautiful pattern, Jennifer and I appreciate how easy it is to adjust to fit my needs. Also, to increase the flow of the poncho a little more, I increased the size of the hook to an N.
Thanks for sharing, Josie! I'm glad you like the pattern! Very beautiful! Thank you for this unique pattern. I'm just not sure why there is a +1 in the beginning chain. It throws the pattern off once I begin increasing.